Product #21527 | SKU QPB202 | 5.0 (based on 1 rating) Thanks for your rating! 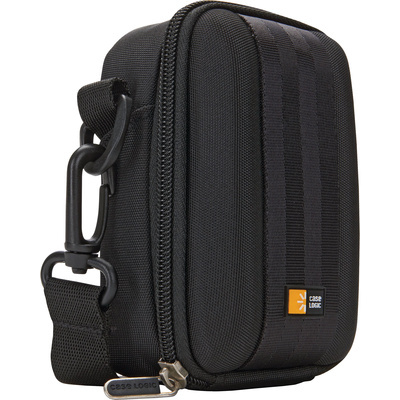 The Case Logic QPB-202 Medium Camera and Flash Camcorder Case (Black) is designed to carry most compact cameras and flash camcorders. The case is made from a lightweight, EVA moulded fabric, a protective, semi-rigid exterior that protects the camera or camcorder from daily wear and tear and a plush, pillow-like interior. There is an internal slip pocket that holds memory cards, batteries or small accessories. It is carried by a removable, adjustable shoulder strap or belt loop. Great little bag, perfect for my compact zoom. Nice soft interior and semi rigid outer for protection.